Humans are exposed to ionizing radiation emitted spontaneously by naturally occurring terrestrial radionuclides such as 238 U,232Th, and their daughters and 40K ever since their existence on the earth. The primordial radionuclides (232Th,238 U and 40K) found in the earth's crust is giving an exposure up to 0.5 mSv/year. Three types of radiations, alpha, beta, and gamma are emitted by different radioactive materials which differ in their energy and penetrating power. Exposures from natural sources of radiation are due to: (a) cosmic rays, (b) radioactive nuclides present in earth's crust, in atmosphere and in building materials, (c) radioactive materials present inside human body (Example:40K) and (d) presence of gaseous radioactive isotopes in air viz., radon (222 Rn), thoron (220 Rn), and their daughters, especially of alpha-emitting daughters. Among all natural sources of radiation dose to human, inhalation of radon and its decay products contribute 50% dose. Quantification of radon, especially inside dwellings, is a desirable input when determining the natural background radiation level to the population. Internal exposures due to the excessive exposure to naturally occurring short-lived daughter products of 222 Rn (218 Po,214 Pb,214 Bi, and 214 Po) in the indoor environment may pose a risk to human health. Radon gas enters houses from the ground through cracks in concrete floors and walls, through gaps between floor and slab, and around drains and pipes and small pores of hollow-block walls. Since the concentration of radon indoors varies with the time of the year, reliable measurements of mean concentration in air should be made covering all the four seasons of 1 year. Radon and its progeny, after inhaling the air, readily deposit in the airways of the lung. Since most of the daughter products of radon isotopes are all alpha emitting particulates; they can irradiate, depending on the deposited quantity, the bronchial epithelial cells. The radon concentration inside a room is dependent on the concentration of radium isotopes in the building materials and the porosity of the building materials. 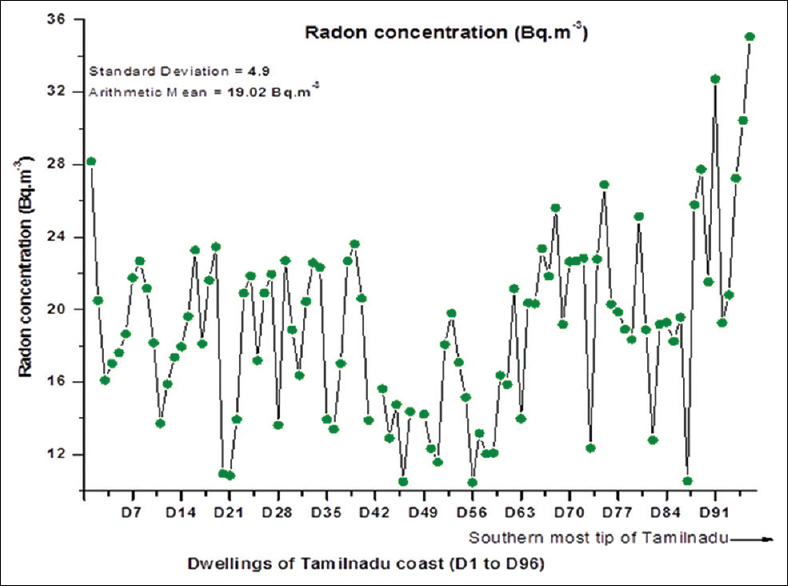 With a view to include the present study of radon concentration levels in the dwellings situated along the east coast of Tamil Nadu along with the ongoing mapping of radon for the entire country, a comprehensive program of estimation of radon concentration in the dwellings along the entire stretch of coast-line was undertaken. The level of gamma dose inside the dwellings largely depends on the radioactivity content in building materials such as cement, marble, tile, granite, and soil, etc., used for construction. Since the east coast of Tamil Nadu is labeled as higher background region, it would be of utmost importance to determine the gamma radiation dose in the dwellings along the coast. In India, a countrywide survey of natural gamma radiation using thermoluminescent dosimeters (TLDs), covering more than 200 locations, spread over a period of 2 years, has yielded a national average value of 0.734 mSv/y as terrestrial gamma background radiation consisting of contributions from cosmic ray component of 0.355 mSv/y and terrestrial component of 0.379 mSv/y. Many investigators have measured the indoor radiation level in dwellings in different parts of the world.,,,, However, no such extensive study has been undertaken in the dwellings situated along the 1000 km East Coast of Tamil Nadu State. TLDs have several advantages for evaluating external exposure over extended periods. It is well known that environmental gamma monitoring using TLDs at all Department of Atomic Energy (DAE) installations is being carried out by environmental monitoring and assessment section of health, safety and environment group, Bhabha Atomic Research Centre to assess the external exposure. Details of the technique such as the packing of the phosphors, energy dependence, self-dose rate, fading, direction dependence, the precision characteristics, and the monitoring procedures are described by Nambi et al. 1986. While measuring the terrestrial exposures, evaluation of external exposure in indoors gains more importance. In the light of the above considerations, it was decided to use environmental TLDs for year long, time-integrated measurements on a long-term basis to evaluate the indoor natural background radiation levels in the dwellings along the coast. [Figure 1] shows the area covered in the present study. The length of the coastal region covered in this study is little more than 1000 km. In all, 32 sites were chosen with the distance between each site being around 30 km. At each site, three dwellings were selected and numbered as D1 to D96 as depicted in [Table 1], and the same is graphically represented in [Figure 2]. Out of 96 dwellings, solid state nuclear track detectors (SSNTDs) and TLDs could not be recovered in two of the dwellings (D42 and D48). The study area starts right from Kanyakumari, at southern-most tip of Indian peninsula, up to Pulicat, situated 30 km North of Chennai, the State capital. This coastal area lies between 8°11' N and 13°04' N latitude and 77°29' E and 80°17'E longitude and covers east coast region of entire Tamil Nadu State. Along the Tamil Nadu coastal area, there are several tourist places. Some notable ones are Mamallapuram, Puducherry, Pitchavaram, Rameswaram, Tiruchendur, and Kanyakumari. In addition, there are major ports such as Chennai and Tuticorin besides the minor ones such as Nagapattinam and Cuddalore. Industrially, this area is a well-developed one. There are many chemical and petrochemical industries in Chennai, Tuticorin, Puducherry, and Cuddalore. A heavy water plant is situated at Tuticorin. At Kalpakkam, two nuclear power reactors are in operation. In addition, two nuclear power reactors of 1000 MWe each are in operation at Kudankulam site near Kanyakumari. Both being coastal areas, the critical population here is fishermen community. It is also known that some regions of the east coast of Tamil Nadu State have higher background radiation level. Hence, it would be of great importance to measure radon and ambient gamma dose rate levels in the dwellings along the coast to establish a base-line data for the posttsunami era. SSNTDs and TLDs were affixed on a thick plastic cardboard, for estimation of radon concentration and gamma dose rate, respectively. Type II nonstrippable LR-115 films (known as SSNTDs films), with a 12 μm thick sensitive cellulose nitrate layer-colored deep red and coated on a 100 μm thick polyester base, were employed in the present study to estimate radon concentration. Two LR-115 type II track detectors each having a size of 25 mm × 25 mm were affixed on a thick plastic cardboard. These boards are suspended inside all the selected dwellings at a height of 1m from the ceiling to take care of the plate-out effect to avoid the depletion of radon daughters' concentration in the air. As described by Nambi et al., 1983, in this study also, CaSO4: Dy powder as TL phosphor material, especially due to its high sensitivity, was used. The TLDs were prepared by filling 40–50 mg of annealed CaSO4: Dy powder in brass capsules. These brass capsules were affixed on a thick plastic cardboard and TLDs were hung at ~100 cm below the house roof to avoid scattered component. The SSNTDs and TLDs were changed once in every 3 months. After the exposure for 3 months, the exposed SSNTDs and TLDs were retrieved, and analyzed for the recorded radon levels. After exposure for about 3 months, the SSNTDs were collected and replaced by fresh ones at end of each quarter, thus covering all the four seasons in 1 year. The exposed SSNTDs (LR-115 type II films) were retrieved and etched in 2.5N NaOH at 60°C for 110 min in a constant temperature bath. After etching, the detectors were peeled off from the plastic base and recorded tracks were counted using a spark counter. In general, three measurements for each detector film were taken, and their average count was used to find the track density (Tracks.cm −2). From the measured track density, the concentration of radon was estimated using a well-established calibration factor, i.e., 0.02 tracks/cm 2/day per Bq/m 3. Similarly, after the exposure for about 3 months, the exposed TLDs are retrieved and analyzed for the gamma dose they recorded, using a PC-based TL reader. To cover all the four seasons in 1 year to infer the seasonal fluctuation, if any, fresh TLDs are replaced once in a quarter. For the estimation of gamma dose recorded by the TLD, a known amount of the phosphor (10 ± 1 mg) is heated to 350°C. All the measurements were performed with a continuous flow of nitrogen gas maintained at a constant flow rate. The light output from the heated phosphor is sensed by a photomultiplier tube, which is optically coupled to a phosphor heating system. The radiation dose received by the exposed phosphor is calculated by peak area method. In this, the area under the TL glow curve at particular temperature is determined using MS Window-based control software “ANALYST.” The TL glow curves are recorded, and the area under the curve is determined. From the already established calibration graph between the dose quantities and TL intensities, the dose received by the TLDs is arrived at. In a similar way, the gamma dose values for the four quarters are measured, added, and normalized to 365 days to obtain the annual gamma dose, prevailing indoors. TLDs were calibrated using 137 Cs source of 50 GBq activity for different doses up to 3 mGy which is available at Radiation Safety Section, Indira Gandhi Centre for Atomic Research, Kalpakkam, Tamil Nadu, India. The estimated radon concentration in 94 dwellings covering the entire East Coast of Tamil Nadu for four different seasons is summarized in [Table 2]. From [Table 2], it may be noted that the radon concentration varied from 8.48 to 35.3 Bq/m 3 with an average of 17.97 Bq/m 3 for spring season, 12.3–56.88 Bq/m 3 with an average of 23.74 Bq/m 3 for winter season, 5.4 to 28 Bq/m 3 with an average of 12.23 Bq/m 3 for summer season, 10.75–41.4 Bq/m 3 with an average of 22.28 Bq/m 3 for rainy season. 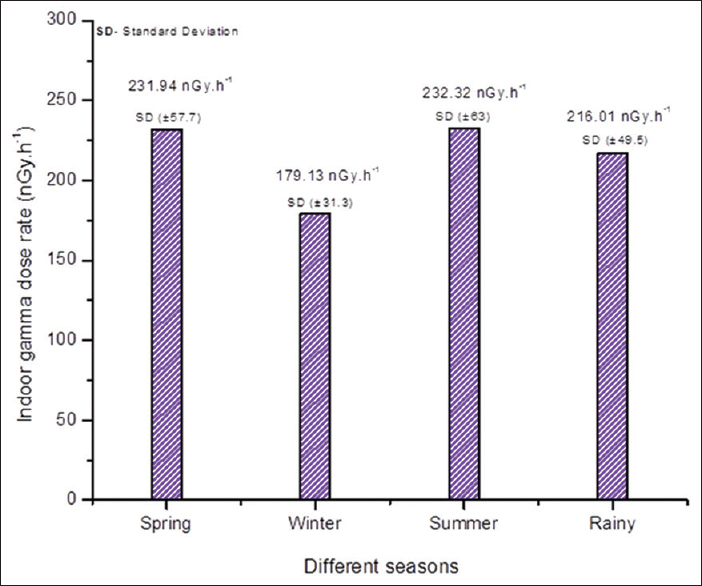 The maximum radon concentration was observed for winter followed by rainy and spring seasons as shown in [Figure 2]. On the contrary, the lesser level of radon concentration (12.23 Bq/m 3) is observed in summer seasons [Figure 2]. This variation must be due to closing of doors and windows of the houses during winter seasons for most of the times, which reduces the air ventilation inside the houses and resulting in accumulation of radon emanating from walls and floors. Radon levels in closed environment are affected both by the degree of exchange with outdoor air as measured by ventilation rate and by changes in the entry rate of radon-rich-air from the underlying soil and rocks. 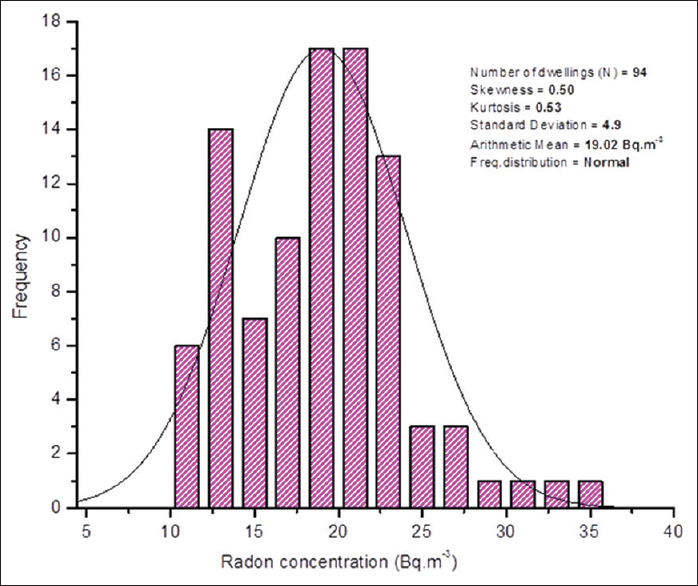 The statistical analysis for the skewness and kurtosis of the distribution was performed for annual radon concentration as shown in [Figure 3]. [Figure 3] represents the frequency distribution histogram of annual indoor radon concentration measurements made in 1 year covering all four seasons. It can be observed from [Figure 3] that the skewness (0.50) and kurtosis (0.53) values are closer to the null value, indicating the existence of symmetrical and normal distribution. This may be due to the even spatial distribution of indoor radon concentration in East Coast of Tamil Nadu. In this study, the average radon concentration has been deduced from the four different seasons and graphically as shown in [Figure 4]. From the observation, the annual indoor radon concentration is showing an increasing trend toward the Southern-most tip of Tamil Nadu coast. The levels of radon concentration inside the dwellings largely depend on the building materials such as soil/river sediment, etc., used for construction as well as the design and ventilation systems., It is a well-known fact that some of the coastal sites of southern-most tip of Tamil Nadu have a high background radiation area and reported to have hotpots containing patches of monazite deposits., This can account for the higher level radon concentration observed at the southern-most part of Tamil Nadu. However, the annual radon concentration (19.02 Bq/m 3) is much lower than the ICRP 103 recommended limit of 300 Bq/m 3 for all the sites (dwellings). Numerous measurements on the concentration levels of 222 Rn and its short-lived decay products in different countries have been reported by UNSCEAR 2000. 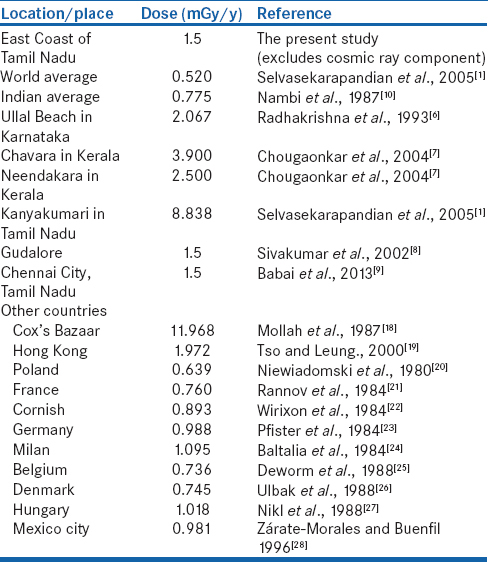 [Table 3] shows the comparison of radon level obtained for east coast of Tamil Nadu with different places in the world. 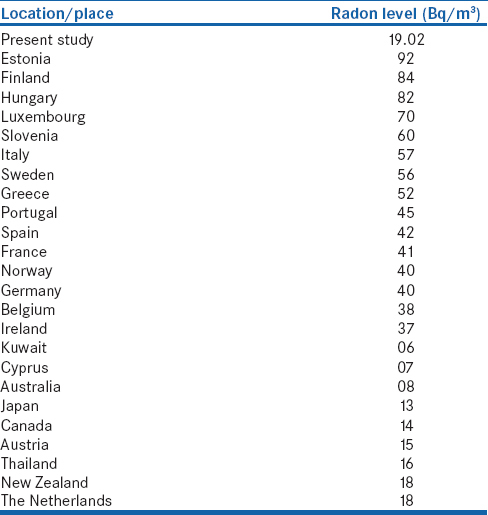 As compared to the present study, the radon concentration is higher in most of the countries whereas lower in some the countries [Table 3]. The value for annual radon concentration obtained in the present study (19.02 Bq/m 3) is lower than both the Indian (42 Bq/m 3) and world (30 Bq/m 3) average values. 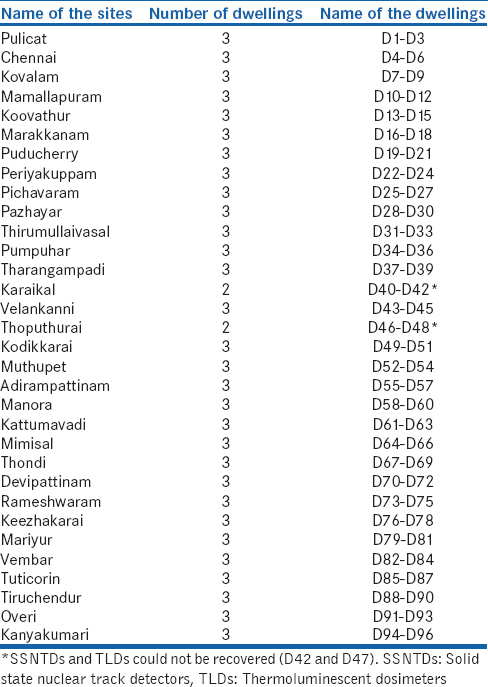 The measured gamma dose rate for the different seasons using TLDs for the 94 dwellings of the entire east coast of Tamil Nadu are shown in [Table 4]. From [Table 4], the gamma dose rate levels varied from 125.68 to 410 nGy/h with an average of 231.94 nGy/h for spring seasons, 122.43 to 287.09 nGy/h with an average of 179.13 nGy/h for winter, 139.16–516.78 nGy/h with an average of 232.32 nGy/h for summer and 143.38–423.66 nGy/h with an average of 216.01 nGy/h for rainy season. 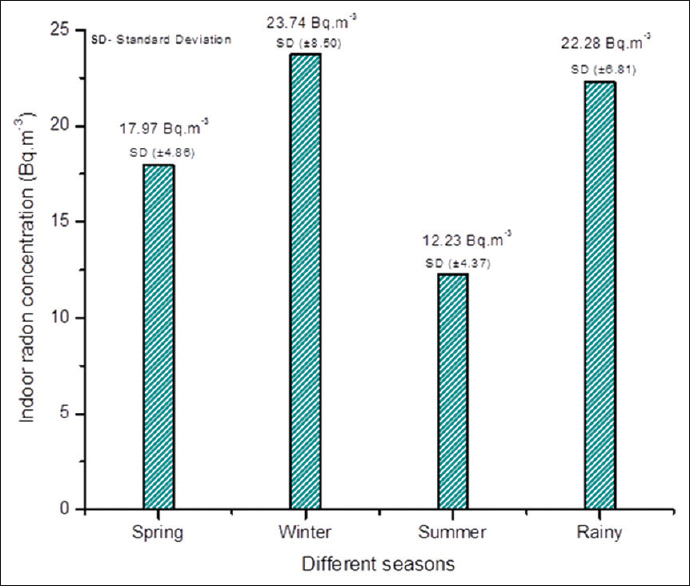 The average gamma dose rate for winter season is slightly lower than other seasons (summer, spring, and rainy) as shown in [Figure 5]. In winter season, the humidity level is higher and due to this, the moisture content increases on the indoor walls and flooring materials. Hence, it is expected that the moisture present on these flooring materials and walls act, to an extent, as an attenuating layer in reducing the background gamma radiation levels, especially indoors, albeit low. Similarly, the statistical analysis for the skewness and kurtosis of the distribution was performed for annual gamma dose rate as shown in [Figure 6]. The skewness and kurtosis coefficients values were calculated and found to be 1.39 and 3.22, respectively. The positive and higher value of skewness obtained for annual dose rates measured in dwellings shows that their distributions are asymmetric with right tail longer than the left as shown in [Figure 6]. The average gamma dose rate also has been deduced from the four different seasons and annual gamma doses are graphically as depicted in [Figure 7]. 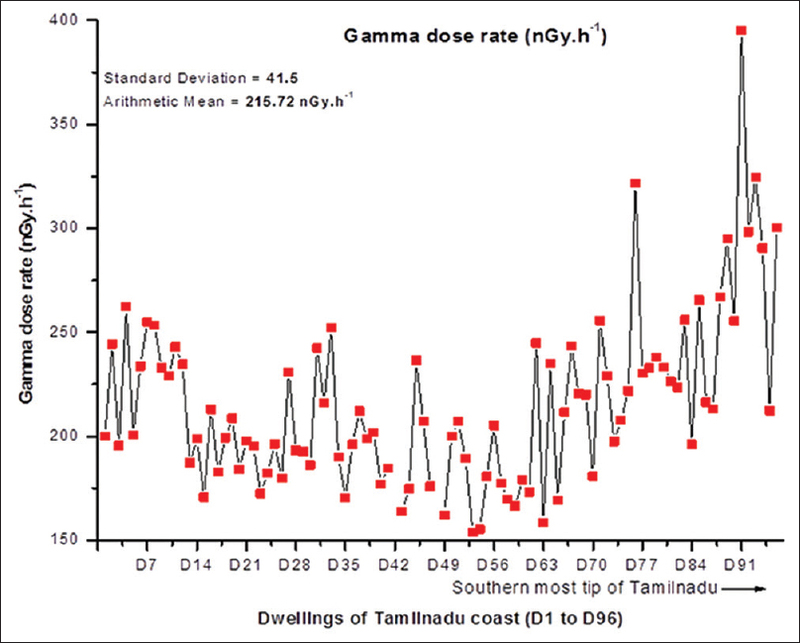 As in the case of annual radon concentration, the annual gamma dose rate too is showing as increasing trend towards the southern-most tip of Tamil Nadu [Figure 7]. 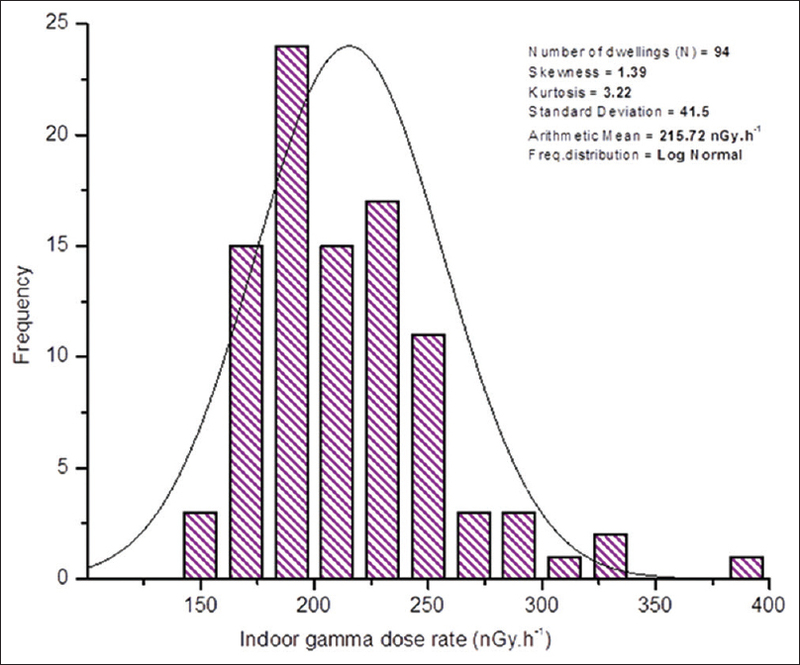 The gamma dose rates vary from one dwelling to another depending upon the concentration of primordial radionuclides (238 U,232Than, and 40K) in the building materials such as soil/river sediment and the primordial radionuclides present in soil outdoors can have its imprint in indoor gamma dose rates. As discussed earlier, it is known that some regions of southern-most tip of Tamil Nadu have higher background radiation level. Therefore, the outdoor soil exposure might have an effect on the increase in indoor gamma dose rate in the dwellings situated around southern-most tip of Tamil Nadu region. The annual indoor gamma dose rate varied from 153.66 to 395.21 nGy/h with an average value of 215.72 nGy/h as shown in [Table 3]. An attempt has been made to compare of indoor radiation levels prevailing in the dwellings of Tamil Nadu coastal region with other environments as shown in [Table 5]. [Table 5] gives the comparison of TLD results obtained for Tamil Nadu coast with different places in the world. The average annual gamma dose rate has been found to be 1.5 mGy/y (excluding the cosmic ray component) which is 2.8 times higher than the world average of 0.52 mGy/y  and 1.93 times higher than national average level of 0.775 mGy/y. However, it is lesser than that reported for high background radiation areas: 0.72 times of Ullal (2.067 mGy/y) in Karnataka coast, 0.38 times of Chavara (3.9 mGy/y) in Kerala coast and 0.6 times of Neendakara (2.5 mGy/y) in Kerala, 0.17 times of Kanyakumari (8.838 mGy/y) in Tamil Nadu, 0.12 times of Cox's Bazaar (11.968 mGy/y) reported by Mollah et al. 1987 and 0.76 times of Hong Kong (1.972 mGy/y) by Tso and Leung, 2000. Many studies undertaken all over the world have indicated that the annual gamma dose rate level in present study is comparatively higher (Gudalore; Chennai city; Poland; France; Cornish; Germany; Milan; Belgium; Denmark; Hungary  and Mexico city ). The most common types of flooring materials used in the dwellings of east coast Tamil Nadu are as follows: (a) cement, (b) marble, (c) tile, and (d) mud. Among these, the cement is used as flooring materials in 59 out of 94 dwellings followed by tiles (20 dwellings), marble (10 dwellings), and mud (5 dwellings). In [Figure 8] is given, the average annual gamma dose rate and radon concentration levels for the four different flooring materials and these results are graphically represented in [Figure 8]. It may be seen from [Figure 8] that the indoor gamma dose rate and radon concentration levels inside the dwellings having marble and tiles as flooring materials, are almost same. In the dwellings having cement as the flooring materials, both the gamma dose and radon concentrations are comparatively higher. A similar observation is also observed in the dwellings of Gudalore, Chennai city, Tiruchirappalli of Tamil Nadu State by Sivakumar et al. 2002, Babai et al. 2012 and Sankaran Pillai et al. 2014, respectively. According to Ramola et al. 1995, the ground surface of the dwellings allows more gaseous radioactive isotopes to diffuse inside the dwellings because of higher porosity of the kind of flooring materials such as cement, marble, tiles, etc., used in the construction of dwellings. The predominant source of indoor gamma dose and radon concentration is due to the natural radioactivity content in the flooring materials used for the construction purpose as reported by Sivakumar et al. 2002. Hence, it is evident that the level of ambient gamma dose rate and radon concentration mainly depends on the porosity of material and the quantity of natural radioactivity content in building materials. In this study, the gamma dose rates as well as the radon concentration are observed to be the lowest in the mud houses as shown in [Figure 8]. From the field observation, the roof of these mud houses are made of coconut leaves, and hence, the reason for the lesser level of gamma dose and radon concentration in those dwellings. The radon concentration and gamma dose rate levels were measured in the various types of dwellings (94 dwellings) of east coast of Tamil Nadu, India using SSNTDs and TLDs, respectively. In winter season, the average radon concentration is higher (23.74 Bq/m 3) as compared to all the other seasons, namely rainy (22.28 Bq/m 3), spring (17.97 Bq/m 3), and summer (12.23 Bq/m 3). This variation is due to closing of doors and windows of the houses during winter seasons for most of the times, which reduces the air ventilation inside the houses and resulting in accumulation of radon emanating from walls and floors. The annual average radon concentration value (19.02 Bq/m 3) is much lesser than the ICRP 103 recommended limit of 300 Bq/m 3 as applicable for the dwellings. From the observation, for winter season, the average gamma dose rate is slightly lower than other seasons (summer, spring, and rainy). The average annual gamma dose rate has been found to be 1.5 mGy/y, which is 2.8 times higher than the world average (0.52 mGy/y) and 1.93 times higher than the national average level (0.775 mGy/y). Both the average radon concentration and the gamma dose rates have shown increasing trend toward the southern-most tip of Tamil Nadu coast. 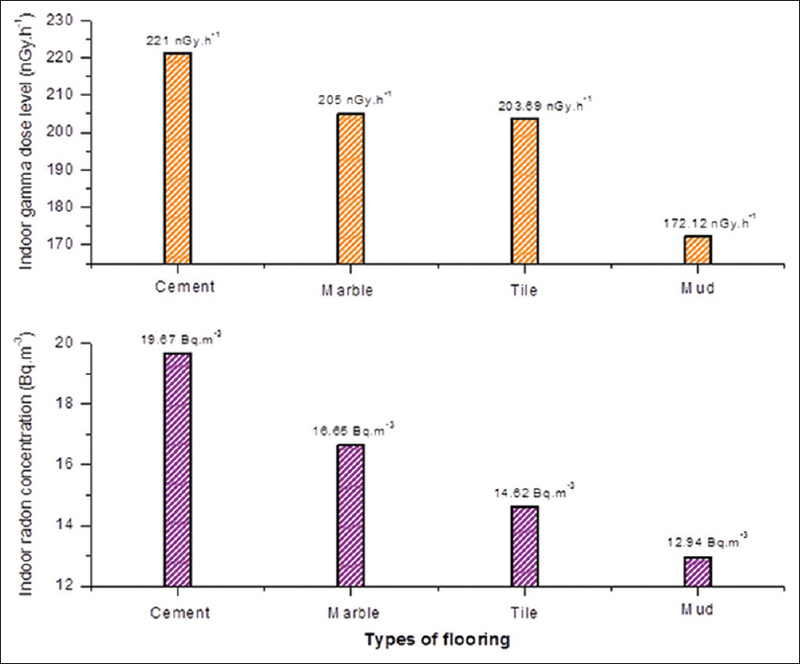 An attempt has been made to find the concentration of radon and gamma dose rate level in different types of flooring materials. From the results, both the radon and gamma dose rate levels are lesser for those having mud floor dwellings with ceiling made of coconut leaves. The value of radon concentration and gamma dose levels inside the dwellings having tiles and marble as flooring materials are almost same. However, in the dwellings having cement as the flooring materials, the radon concentrations and gamma dose rate are comparatively higher. The authors gratefully acknowledge Board of Research in Nuclear Science, DAE, Government of India, for funding the Major Research Project (Sanction No. 2006/36/21-BRNS) on 'Studies on Environmental Radiation along the East Coast of Tamil Nadu after Tsunami' and the authors are very much thankful to Director, IGCAR and Head, RSD, IGCAR, Kalpakkam, Tamil Nadu, for their constant encouragement and granting permission to use some of their facilities for undertaking measurements. Selvasekarapandian S, Lakshmi KS, Brahmanandhan GM, Meenakshisundaram V. Indoor gamma dose measurement along the east coast of Tamil Nadu, India using TLD. Int Congr Ser 2005;1276:327-8. Sannappa J, Chandrashekara MS, Sathish LA, Paramesh L, Venkatramaiah P. Study of background radiation dose in Mysore city, Karnataka state, India. Radiat Meas 2003;37:55-65. Stranden E, Berteig L, Ugletveit F. A study on radon in dwellings. Health Phys 1979;36:413-21. Maher EF, Rudnick SN, Moeller DW. Effective removal of airborne 222 Rn decay products inside buildings. Health Phys 1987;53:351-6. Nambi KS, Basu AS, Iyengar MA, Kannan V. Pre-operational External Radiation Monitoring in the Kalpakkam Environs Using TLD, BARC-1214; 1983. Radhakrishna AP, Somashekarappa HM, Narayana Y, Siddappa K. A new natural background radiation area on the Southwest coast of India. Health Phys 1993;65:390-5. Chougaonkar MP, Eappan KP, Ramachandran TV, Shetty PG, Mayya YS, Sadasivan S, et al. Profiles of doses to the population living in the high background radiation areas in Kerala, India. J Environ Radioact 2004;71:275-97. Sivakumar R, Selvasekarapandian S, Mugunthamanikandan N, Raghunath VM. Indoor gamma dose measurements in Gudalore (India) using TLD. Appl Radiat Isot 2002;56:883-9. Babai KS, Poongothai S, Punniyakotti J. Determination of environmental radioactivity (238 U,232Th and 40K) and indoor natural background radiation level in Chennai city (Tamilnadu state), India. Radiat Prot Dosimetry 2013;153:457-66. Nambi KS, Bapat VN, David M, Sundaram VK, Sunta CM, Soman SD. Country-wide environmental radiation monitoring using thermoluminescence dosemeters. Radiat Prot Dosimetry 1987;18:31-8. Nambi KS, Bapat VN, David M, Sundaram VK, Sunta CM, Soman SD. Natural Background Radiation and Population Dose Distribution in India. Health Physics Division Report, BARC; 1986. p. 30. Babai KS, Poongothai S, Lakshmi KS, Punniyakotti J, Meenakshisundaram V. Estimation of indoor radon levels and absorbed dose rates in air for Chennai city, Tamil Nadu, India. J Rdioanal Nucl Chem 2012;293:649-54. Wilkening M. Sesonal variation of indoor 222Rn at a location in southwestern United States. Health Phys 1986;51:427-36. Lakshmi KS, Selvasekarapandian S, Khanna D, Meenakshisundaram V. Primordial radionuclides concentrations in the beach sands of East coast region of Tamil Nadu, India. Int Congr Ser 2005;1276:323-4. Punniyakotti J, Ponnusamy V. Mineralogical role on natural radioactivity content in intertidal sand samples of southern region of Tamil Nadu coast, India. J Rdioanal Nucl Chem 2017;314:949-59. United Nations Scientific Committee on the Effects of Atomic Radiation (UNSCEAR). Sources and Effects of Ionizing Radiation. Report of the United Nations Scientific Committee on the Effects of Atomic Radiation to the General Assembly. United Nations, New York, USA: UNSCEAR; 2000. Mollah AS, Rahman MM, Koddus MA, Husain SR, Malek MA. Measurement of high natural background radiation levels by TLD at Cox's Bazar coastal areas in Bangladesh. Radiat Prot Dosimetry 1987;18:39-41. Tso MY, Leung JK. Population dose due to natural radiation in Hong Kong. Health Phys 2000;78:555-8. Niewiadomski T, Koperski J, Ryba E. Natural radiation in Poland and its disturbance in an urban environment. Health Phys 1980;38:25-32. Rannov A, Posny F, Guezengar JM, Madelment C. Study of natural irradiation in dwelling places in France. Radiat Prot Dosimetry 1984;7:317-20. Wirixon AD, Browm L, Cliff LD, Driscoll CM, Green BM, Miles JC. Indoor radiation survey in the UK. Radiat Prot Dosimetry 1984;7:321-5. Pfister H, Pavly H. Population exposure due to natural radiation in an urban district of the Federal Republic of Germany. Radiat Prot Dosimetry 1984;7: 279-82. Baltalia A, Bozzano E, Carioni T. Indoor dose in Milan. Radiat Prot Dosimetry 1984;7:283-5. Deworm JP, Slegers W, Gillard J, Flemal JM, Culst JP. Survey of the natural radiation of belgium territory as determined by different methods. Radiat Prot Dosimetry 1988;24:347-51. Ulbak K, Steaum B, Sorensen A, Majborn A, Botter-Jensen L, et al. Results from the Danish indoor radiation survey. Radiat Prot Dosimetry 1988;24:401-5. Nikl I, Sztanyik LB. External indoor and outdoor gamma exposures in Hungary during the period of 1983–1986. Radiat Prot Dosimetry 1988;24:387-9. Zárate-Morales A, Buenfil AE. Environmental gamma dose measurements in Mexico city using TLD. Health Phys 1996;71:358-61. Sankaran Pillai G, Mazhar Nazeeb Khan SM, Shahul Hameed P, Balasundar S. Radon exhalation rate from the building materials of Tiruchirappalli district (Tamil Nadu state, India). Radiat Prot Environ 2014;37:150-6. Ramola RC, Rawat RB, Kandari MS. Estimation of risk from environmental exposure to radon in Tehri Garhwal. Nucl Geophys 1995;9:383-6.